Fludia and Energies Attitude. Earlier I’ve shortly described the company Fludia and its energy saving solutions. I’ve had the opportunity to exchange further about Fludia with Marc Bons, the Founder of the company, and Alexandre Neto, Technical Energy Consultant. Marc Bons, worked first at EDF Business Innovation Group where he accompanied start-up companies. In 2002, he founded Fludia, based on two pillars : (1) a new technology for optical energy measurement and end-user analysis and (2) the increasing market for energy consumption visualisation. Alexandre Neto, electrical engineer joined Fludia in 2008 and has become one of the key technical consultants. The Fludiameter, the companies optical reader has been further developed and patented. The tool measures the electrical current per second with an optical reader and provides detailed technical data. 1. 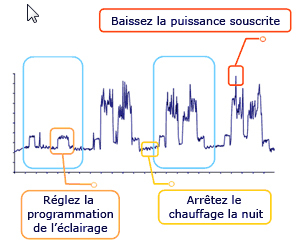 Baseline Measurements : During three to four weeks the energy use is measured (‘Etat des Lieux’ in French) with the Fludiameter. Results are discussed with the management and realistic objectives to reduce energy are defined. Example of analyses of Baseline Measurement of 3 days. 2. Implementation of New Objectives. Fludia organises workshops with small groups of employees. Fludia explains to the employees how small behavioural changes can make the difference. Think about turning off the computer screen, which reduces the energy consumption from 20 to 0 Watt. Or lowering the temperature of unused rooms. Often, a real-time energy consumption screen is shown in the company hall to motivate people, as shown below. Real-time presenting of the companies energy consumption, CO2 equivalent and energy costs compared to baseline and objective. 2. Feedback and Communication. Energy and cost savings are reported back at the end of the campaign. Cost Reduction : Energy saving and cost reductions vary from 5 to 25%, depending on the customer This leads to a Return of Investments ranging from 6 months to 2 years, according to Fludia. Unique : Combining technology with analysing expertise. With its services, Fludia is unique in France as it combines the easy to implement technology of the Fludia-Meter, the teams analysing expertise, the customised advice and the employee mobilisation trainings. Complementary to the Bilan Carbone. The Energy audit of Fludia is seen as complementary to the Bilan Carbone that is labelled by ADEME. 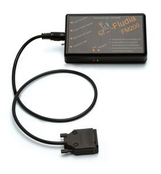 Fludia’s analyses go into much more detail with respect to energy use, as it is based on energy fluctuations through-out the day and includes recommendations with respect to electrical equipment and user behaviour. Maybe one day Fludia’s indicators will be adopted by ADEME ? Fludia’s key customers are first of all public institutions like Rueil, Nanterre, Longjumeau, Chelles and Le Vésinet. The interest from the private sector is rising too. For instance, Saint Gobain in the Auvergne is measuring new buildings built as ‘Batiment Basse Consomption’ (BBC). Strategic Partner of Fludia is first of all EDF, that is commercialising Fludia’s diagnostic services. Also, the SYDEV and SIGEIF (organisations working for municipalities) are partners and customers of Fludia. Mini Corporate Responsibility Strategy. Fludia is trying to behave responsible on its own scale, like its customers do. Regular measurements of electrical consumption are common. Marc Bons favours a pleasant working environment and choosing public transport over transport by car. Developments. Fludia is constantly developing its analysing and expert communication skills with respect to energy currents. Further more, it is investigating the application of the Energies Attitude in the consumer market and is offering ‘test offers’ (69 TTC) to be installed by the consumers themselves. French apartments could use some Renovation. Do you know that French houses use more than twice the energy on average than its equivalent Northern European houses ? See an earlier post. Denis Baupin, deputy of major Bertrand Delanoe from the Ecologists Party, adds that the 100.000 Parisien apartments use the energy equivalent to the production of 4 nucleair plants. Before, citizens did not pay much attention to energy use, as it was not regarded as expensive nor scarce. This is all changing now. The City of Paris wants to stimulate housing renovation to reduce the cities energy use. Encouraged are insulation works, installing double windows, changing heating systems or changing habits such as closing the windows and window shutters. Thermographic Maps to show the energy leaks. Currently, a website is being built with ‘thermographic’ maps and building pictures of all Parisien building types. The infrared pictures, will allow people to understand better where and to which extend their house is tending to leak energy (heath) for instance through windows or doors. The maps won’t replace a customised thermic diagnostic of individual building but nevertheless gives a good idea of the necessity of better insulation. During the ‘Journées Parisiennes Energie et Climat’ (22-25 October), the first 500 building facade pictures were shown in the Palais Brongiart. The infrared pictures were made in the winter (temperature below 5 degrees). The colour red indicates a strong energy loss, the colour blue indicates good insulation. source : www.leparisien.fr ‘les pertes de chaleur détectées a l’infrarouge’.